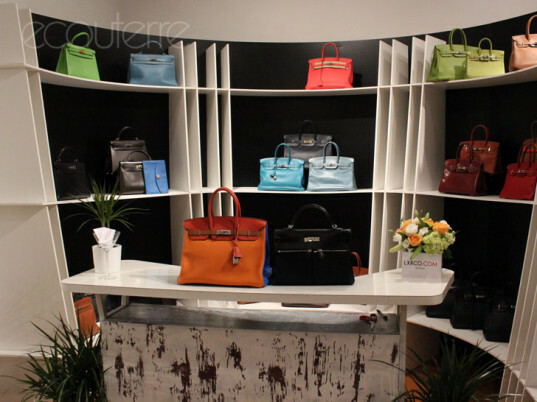 Photos by Yuka Yoneda for Ecouterre A vending machine filled with Louis Vuitton bags, a "bar" where you can order up Hermès Birkins instead of drinks, and a collection of the most elusive Chanel purses are just some of the delights that await shoppers inside LXR & Co.'s new holiday pop-up shop. The luxurious little boutique boasts all kinds of vintage and pre-owned treasures that have been hand-selected by LXR's team of professional appraisers, many of them from the closets of celebrities and other style icons. Ecouterre recently visited the the SoHo boutique for its grand opening; flip through our gallery for a selection of our favorite pre-loved fashion finds. 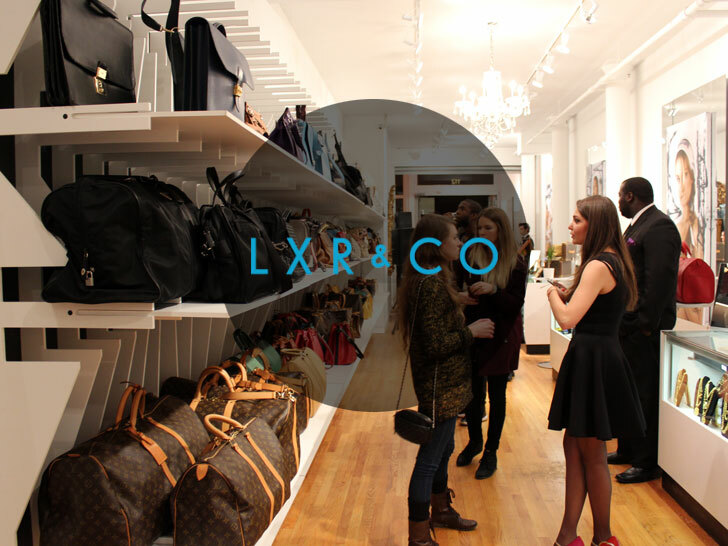 LXR & Co. was launched by Frédérick Mannella, Kei Izawa and Jean-Philippe Robert in 2012 and offers up its luxury pre-owned merchandise through www.lxrco.com and its flagship store in Beverly Hills, Calif. The brand recently decided to bring the crème de la crème of its inventory to New York City as part of a pop-up shop for the holidays. The temporary Wooster St. location was designed by New York City artist Ryan Keeley and architect Gregory Okshteyn of Studios Go, with a modern mix of Keeley’s own art adorning the walls. LXR prides itself on making some of the world’s most sought-after pre-owned luxury goods a little more accessible. LXR prides itself on making some of the world’s most sought-after pre-owned luxury goods a little more accessible to the everyday girl or guy. Its pieces are in such mint condition, however, that you can hardly tell they’re not brand new. And if you ask us, paying $500 to $3,000 less for a designer bag that has been gently used is a no-brainer. Some of the fashion world’s most popular bloggers and tastemakers agree. The Man Repeller‘s Leandra Medine, Chiara Ferragni of The Blonde Salad, Wendy Nguyen of Wendy’s Lookbook, and Shea Marie of Peace, Love, Shea are just a few of the style icons that have purchased LXR & Co.’s wares. The holiday pop-up shop will be open through the end of December and is located at 112 Wooster St. (on Wooster between Spring and Prince). XR & Co. was launched by Frédérick Mannella, Kei Izawa and Jean-Philippe Robert in 2012 and offers up its luxury pre-owned merchandise through www.lxrco.com and its flagship store in Beverly Hills, Calif.
. The brand recently decided to bring the crème de la crème of its inventory to New York City as part of a pop-up shop for the holidays. The temporary Wooster St. location was designed by New York City artist Ryan Keeley and architect Gregory Okshteyn of Studios Go, with a modern mix of Keeley's own art adorning the walls. LXR prides itself on making some of the world's most sought-after pre-owned luxury goods a little more accessible to the everyday girl or guy. Its pieces are in such mint condition, however, that you can hardly tell they're not brand new. And if you ask us, paying $500 to $3,000 less for a designer bag that has been gently used is a no-brainer. Some of the fashion world's most popular bloggers and tastemakers agree. The Man Repeller's Leandra Medine, Chiara Ferragni of The Blonde Salad, Wendy Nguyen of Wendy's Lookbook, and Shea Marie of Peace, Love, Shea are just a few of the style icons that have purchased LXR & Co.'s wares. “Fashion icons remain icons because they are timeless. Our products never go out of style and are a sure investment for any fashionista out there," LXR & Co's CEO Jean-Phillipe Roberts tells Ecouterre. "There will always be a demand for our pieces and, customers now have easy access to high quality products at a fraction of the price," he adds. A team of experts is on hand to help you with your shopping. Don't forget to check out the Chanel section in the back; it's one of the store's most popular.